This is hopefully the most detailed I'm gonna get, and I'm still trying to keep prep as minimal as possible. It's got storylines and ideas I've been sitting on for quite a while now, so it's pleasing for me to see the world creation and history combine into whatever the hell this is. Hope it makes sense and is a logical evolution of religious thought that sets up some decent factions for the players to tangle with. If there is a creator of the universe, they are a distant, unknowable entity that has never answered the questions of those it brought into being. Gods, monsters, and sentient beings have all called out to it, but have only ever been answered with silence. Who or whatever they are, they brought into being the universe and populated it with sentient creatures of varying degrees of power, their number increasing with their weakness, and scattered them across the stars on distant worlds. One such world is Arkha. Orbited by the two moons, it is the third world of a planetary system around a single sun it shares with five other planets. This is your home. The Arkharnen are a pantheon of ancient nature gods and spirits that are said to have created these worlds, and each god represents one element of the natural world. Their worship is wide-spread, found in all known cultures, though local differences in name and variations in representation are common. The pantheon includes gods of the sky, the earth, the seas, the stars, the sun and moons; of animals and plants and storms and other expected entities who’s aspect is found locally. They are able to teach those gifted devotees some of the secrets of creation, and impose upon them the responsibility to maintain and care for their world. It is said that in the beginning the Arkharnen lived side by side with humans in a sacred land simply called the Garden, but in their eagerness to emulate the wonder of the gods, humans stole the secrets of creation magic when it was not theirs to take. The Arkharnen forgave them, and tried to teach them the correct methods of its use; but the frailties of the human body could not handle such power, and their creations were poisoned by human’s mortality. It is from these mistakes that the Jugger Behem were born, monstrous manifestations of suffering that the Arkharnen were forced to exile beyond the realms of existence. 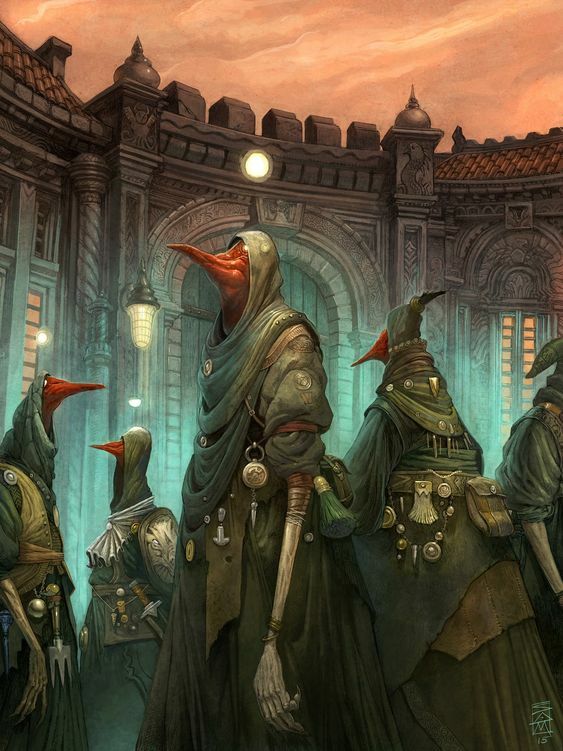 Eventually the Arkharnen forbade the practice among humans, but it was too late; when they were found to be working magic in secret, they were cast out and the Arharnen removed themselves from direct contact with them for fear of greater theft. The Garden was abandoned and forsaken, and sealed off from the world. Thaumaturgy is the ancient practice of magic, a stolen variation of the divine creative powers of the Arkhanen. It is very powerful, very dangerous, and places terrible burdens upon those who practice it, for it alters and corrupts the user in the same way the user alters and corrupts the world as envisioned by the Arkharnen. As such, its use is severely restricted by the Clades — the noble houses of mutant sorcerer-kings that control the Thaumatrian Empire. It is said to utilise the same powers that created the world, and its initial codification and study was developed eons ago, possibly even taught to the clades by the Creators at the dawn of the world. Much of the true nature and knowledge of Thaumaturgy was lost in the ancient devastation that followed when the Jugger Behem manifested on the world, and Thaumatrian scholars sift through ancient ruins in the hope of recovering lost fragments of texts and artefacts. Jugger Behem is the name given to a pantheon of monstrous gods that represent the great maladies that plague the living. Each god represented a different element of suffering, and the practitioners of Jugger Behem sought to placate and appease them through human sacrifice. 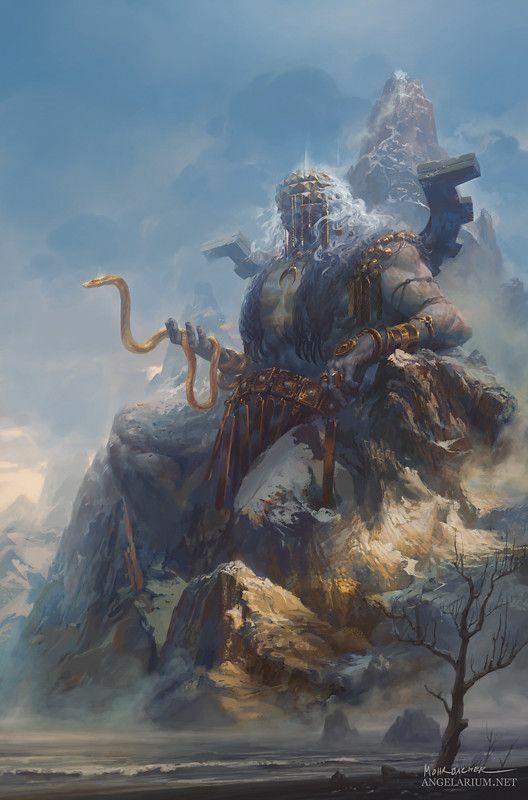 Centuries ago the Jugger Behem placed increasingly vile demands upon their supplicants and human civilization became greatly debased, until Verlauha, the first of the ancient hero-kings, held firm against them and refused to give them any more of his subjects. Enraged, the Jugger Behem chose to make an example of Verlauha, and seven of the Jugger Behem manifested in his kingdom. A double eclipse of sun and moons heralded their arrival: seven colossal creatures called Leviathans emerged from a great rift in the heart of Verlauha’s land and destroyed it within the hour. But their arrival only inspired the other human kings to rise up against the Jugger Behem, and the great Leviathan War began. The Leviathans were simply too great and powerful to be defeated by the sword; only the arcane powers of the sorcerer-kings could hold them at bay. 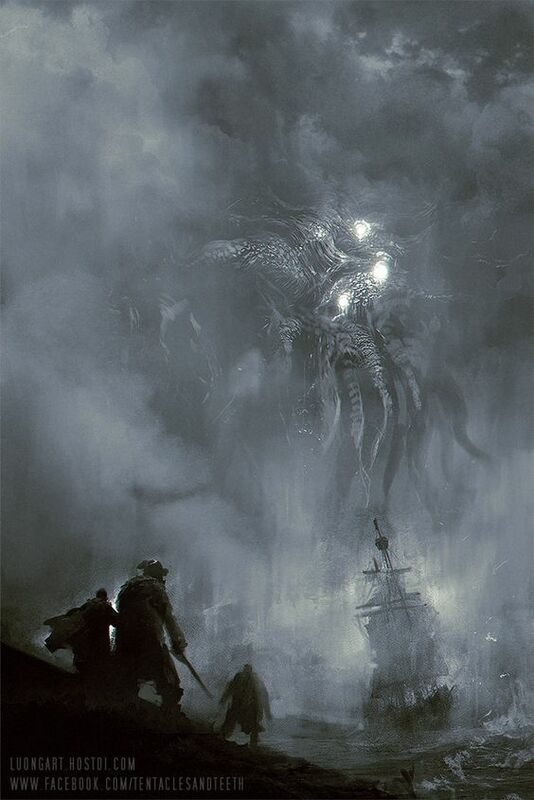 Eventually the remnants of the human kingdoms fled across the narrow seas to a new land free from the presence of the Jugger Behem, and erected thaumaturgical defences that stopped the Leviathans from crossing. The descendants of the sorcerer-kings and their families formed Thaumatrian Empire, and worked together to protect all their peoples against further depredations of the Leviathans. Some still chose to practice appeasement of the Jugger Behem, but such practices are publicly reviled and shunned. Secret cults still gather to practice sacrificial acts in seclusion, and are still manipulated by one or more of the monstrous gods. Their aims are unclear, though the suffering of all peoples seems to be their goal, and it is said that they work towards opening a permanent rift between this world and theirs. At times of solar eclipse monstrous beings do manage to cross over, and they always seek out practitioners of thaumaturgy with the intent to kill them. Analysis of these astronomical events led to the rise of Astromancy, in order to predict the coming of more Jugger Behem. Astromancy is the astrological study of the heavenly bodies to determine the right course and time for action. As the sun, the two moons, the five planets and all the stars trace a predictable trajectory through the cosmos, it is possible to translate their position at the birth of an individual, entity or course of action, and predict various momentous events during their existence, as well as the means by which they end. 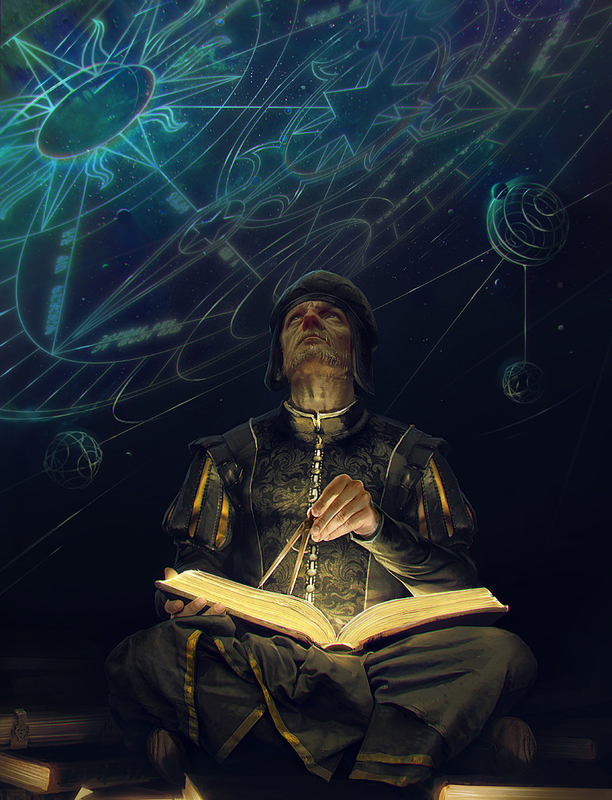 Actions undertaken when the stars are favorable are far more likely to achieve the desired outcome, and it is said that a true master of astromancy can predict the rise and fall of nations. By utilising these astrological practices and uniting them with arcane study, it is possible to create magic of cosmological significance. This is a really interesting setting and the images you’ve collected to illustrate it are very evocative. I’ve always been one for including black powder in my fantasy RPGs so glad to see it being done so well here. Any plans to publish this stuff? I'm not sure about publish, yet. I mean ultimately yeah that'd be great to release a setting book, maybe system agnostic so that it doesn't matter what game you play, you can just use the ideas (see Jack Shear's Krevborna for a great example).